Porcelain Veneers: Are They Right For Me? Going to the dentist is not exactly anyone’s favorite activity. Yet, it is a necessity for most of us (or at least it should be). With all the available online information, it can be a challenge to get the information that you are looking for. I started this blog to help patients make educated decisions about their dental care. Porcelain veneers have been used in dentistry for many years as a quick way to restore patients’ smiles. A quick consultation appointment can determine if porcelain veneers are right for you. If you have chipped, crooked, discolored or uneven teeth, you might be a candidate for porcelain veneers. WHAT EXACTLY ARE PORCELAIN VENEERS? They are thin, tooth-shaped shells that are placed on the front of your teeth after they have been slightly re-contoured. Porcelain veneers are chemically bonded using strong adhesive material and become part of the tooth itself. The result is a beautiful smile that can be seen right away. 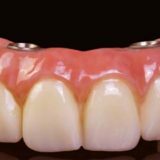 CAN PORCELAIN VENEERS IMPROVE MY SMILE? While porcelain veneers can be used to replace a small missing portion of your teeth, they are not indicated to restore large defects. They can also be used for correction of minor misalignment of teeth in lieu of orthodontics. This can significantly shorten the treatment time associated with orthodontics. Although teeth whitening can be used to improve teeth shade, porcelain veneers provide the added benefit of modifying the size and shape of teeth. If you have small teeth, spaces between them or would like to improve the shape and/or dimensions of your teeth, porcelain veneers might be right for you. This is especially true if you have permanent teeth that are shaped like “baby” teeth. 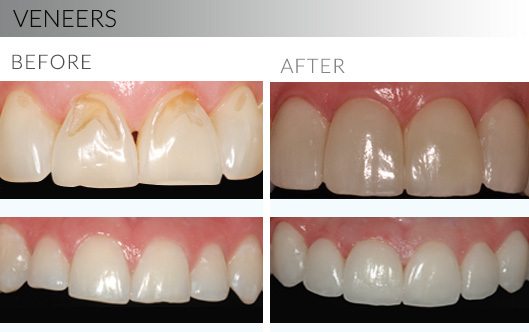 Veneers can be used to restore teeth to their natural appearance and give you the great smile you’ve always wanted. HOW LONG DOES IT TAKE TO GET VENEERS? During the initial consultation appointment, a thorough evaluation of your teeth and gums is completed. An aesthetic try-in (“mock-up”) serves as a blueprint for the final product. It allows you to evaluate the appearance of the planned restoration prior to performing any dental work, and help you decide if further modifications are needed. Porcelain veneers can be completed in 2-3 visits. The first visit typically involves making final impressions (molds) of the teeth after they have been lightly prepared. Temporary veneers are made and attached to your teeth during the same visit and the shade of the teeth is recorded. 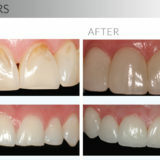 At the second visit, the temporary veneers are removed, and the final veneers are tried in and evaluated for any adjustments before final cementation. WHAT CAN I DO TO MAINTAIN MY VENEERS? Get professional cleanings: remember to schedule your dental hygiene appointments bi-annually to maintain the health of your teeth and gums. Wear your night guard: if you clench or grind your teeth (especially during sleep), it’s a good idea to protect your veneers and teeth with a custom-made night guard. Avoid hard foods: although they are made from strong porcelain material, care should be taken while chewing. Hard foods should be avoided be avoided to minimize the possibility of chipping. While you may experience some sensitivity, especially to cold and hot foods or liquids, this usually subsides in the first two weeks. Continue to brush and floss your teeth: twice a day, with a fluoride-containing toothpaste and mouthwash. Avoid any abrasive toothpaste that may cause the polished surface of your veneers to become rough. WHO SHOULD PLACE MY VENEERS? Although porcelain veneers have become a routine dental procedure, their placement remains a relatively technique-sensitive procedure. A dentist with advanced training and extensive experience in aesthetic procedures is recommended to ensure a predictable outcome and longevity for your restorations. Call us today to schedule your consultation and find out how veneers can help improve your smile. If you are looking for a skilled dentist who goes the extra mile for his patients and delivers exceptional service, I recommend Dr. Azim. He instantly put me at east with his friendly and easy going demeanor. Very knowledgeable and easy to talk to. He made it very convenient and comfortable to get dental work done, and accommodated my schedule. Although he took the time to walk me through the exam, and explain his findings, he managed to get me in and out of my appointment on time. He provided me with multiple and detailed treatment options and took into consideration my needs, expectations and budget. Highly recommended. I feel very fortunate to have been referred to Dr. Azim: l appreciate how thorough, detailed, compassionate and caring he is. I’d been seen by 6 different dentists before I was referred to Dr. Azim, and all 6 told me either that the work l needed was too complicated for them, or that the costs would be prohibitive. Dr Azim listened to me compassionately, and came up with both short- and long-term plans to meet my needs. My family is so impressed with the care l’ve received that they’re considering transferring their care to him too. Dr. Azim goes above and beyond to make sure his patients are comfortable with their procedures and understand the entire process. Unlike other dentists I went to for consultations he was very straightforward and transparent. What really sold me was his impressive patient before/after pictures. You’ll definitely leave his office completely satisfied– highly recommend! Dr. Azim is a great dentist. His chair side manner is amazing. He explained all the details about my dental procedure and called me to follow up the next day after it was completed. I recommended him to my mother-in-law and she was very satisfied with the level of care she received. I had a great experience at Dr. Azim’s office. You are initially greeted by the best welcoming staff, then taken care by the most knowledgeable, experienced and kindest doctor. Dr. Azim has excellent chair side manners, explains all procedures in details and makes sure that you are satisfied with all steps. Highly recommend him and his office. Dr. Azim is fantastic! On top of being very good at what he does, he’s extremely nice and easy going. I can’t recommend Dr. Azim enough. outstanding doc. Did a great job for me in a record time with relatively lower costs. Personalized service, very responsive. best teeth doc ever treated me. I had nothing but a pleasant experience at this dentist. Everything I hate about going to the dentist and doctors in general was not a problem at all for me. Not only was the website easy to manage, Dr. Azim explained all I needed to know very clearly so everything about my restoration procedure was transparent, not to mention he is a very respectful dentist. Highly recommend. Dr. Azim is amazing! Every time I visit him, I am greeted with the warmest welcome! I high recommend everyone to go to him as every time I go, I leave with the PERFECT smile. Copyright by sfdentist.org 2017. All rights reserved. Please be aware that this is not a secure email network under HIPAA guidelines. Please do not submit any personal or private information unless you are comfortable doing so. Please understand that if you email us, you are agreeing to the use of an unsecured method and understand all replies will be sent in the same fashion and you are authorizing this. By continuing to use this site you hereby agree to hold Tamer Azim, DDS PC, its doctors and affiliates, harmless from any breach or any other unauthorized use of your personal information by outside parties. This website is provided for information and education purposes only and is not intended to offer specific medical or surgical advice to anyone. No doctor/patient relationship has been established by the use of this site, and no diagnosis or treatment is being provided. The information contained here should be used in consultation with a doctor of your choice. No claim or opinion on these pages is intended to be medical advice or to replace a one-on-one relationship with a qualified health care professional. No guarantees or warranties are made regarding any of the information contained herein.